There were just enough mathematically-themed comic strips last week to make two editions for this coming week. All going well I’ll run the other half on either Wednesday or Thursday. There is a point that isn’t quite well, which is that one of the comics is in dubious taste. I’ll put that at the end, behind a more specific content warning. In the meanwhile, you can find this and hundreds of other Reading the Comics posts at this link. Thaves’s Frank and Ernest for the 11th is wordplay, built on the conflation of “negative” as in numbers and “negative” as in bad. I’m not sure the two meanings are unrelated. The word ‘negative’ itself derives from the Latin word meaning to deny, which sounds bad. It’s easy to see why the term would attach to what we call negative numbers. A number plus its negation leaves us zero, a nothing. But it does make the negative numbers sound like bad things to have around, or to have to deal with. The convention that a negative number is less than zero implies that the default choice for a number is one greater than zero. And the default choice is usually seen as the good one, with everything else a falling-away. Still, -7 is as legitimate a number as 7 is; it’s we who think one is better than another. 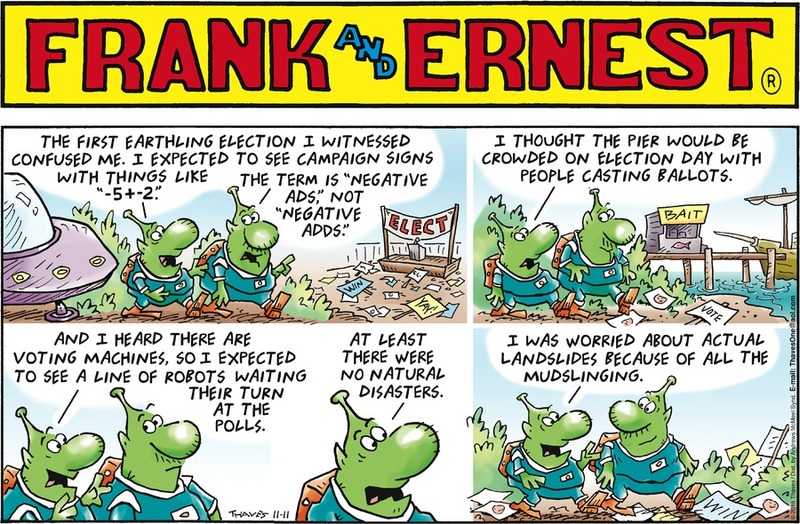 Thaves’s Frank and Ernest for the 11th of November, 2018. Other essays mentioning Frank and Ernest will be at this link. J C Duffy’s Lug Nuts for the 11th has the Dadaist panel present prime numbers as a way to communicate. I suspect Duffy’s drawing from speculations about how to contact alien intelligences. One problem with communicating with the truly alien is how to recognize there is a message being sent. A message too regular will look like a natural process, one conveying no more intelligence than the brightness which comes to most places at dawn and darkness coming at sunset. A message too information-packed, peculiarly, looks like random noise. We need an intermediate level. A signal that it’s easy to receive, and that is too hard to produce by natural processes. J C Duffy’s Lug Nuts for the 11th of November, 2018. This and other essays mentioning Lug Nuts will be at this link. 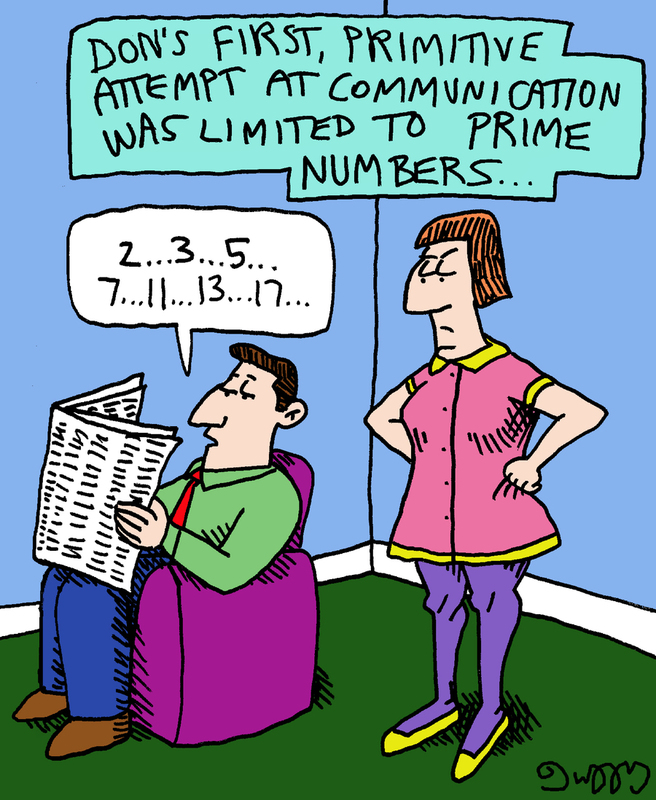 Prime numbers seem like a good compromise. An intelligence that understands arithmetic will surely notice prime numbers, or at least work out quickly what’s novel about this set of numbers once given them. And it’s hard to imagine an intelligence capable of sending or receiving interplanetary signals that doesn’t understand arithmetic. (Admitting that yes, we might be ruling out conversational partners by doing this.) We can imagine a natural process that sends out (say) three pulses and then rests, or five pulses and rests. Or even draws out longer cycles: two pulses and a rest, three pulses and a rest five pulses and a rest, and then a big rest before restarting the cycle. But the longer the string of prime numbers, the harder it is to figure a natural process that happens to hit them and not other numbers. We think, anyway. Until we contact aliens we won’t really know what it’s likely alien contact would be like. Prime numbers seem good to us, but — even if we stick to numbers — there’s no reason triangular numbers, square numbers, or perfect numbers might not be as good. (Well, maybe not perfect numbers; there aren’t many of them, and they grow very large very fast.) But we have to look for something particular, and this seems like a plausible particularity. Charles Schulz’s Peanuts Begins for the 11th of November, 2018. It originally ran the 11th of August, 1954. Essays discussing topics raised by Peanuts will be at this link. That’s for either the “current” newspaper run, currently doing strips from 1971, or for the “vintage” reruns as here, showing strips from 1954. Charles Schulz’s Peanuts Begins for the 11th is an early strip, from the days when Lucy would look to Charlie Brown for information. And it’s a joke built on conflating ‘zero’ with ‘nothing’. Lucy’s right that zero times zero has to be something. That’s how multiplication works. That the number zero is something? That’s a tricky concept. I think being mathematically adept can blind one to how weird that is. If you’re used to how zero is the amount of a thing you have to have nothing of that thing, then we start to see what’s weird about it. But I’m not sure the strip quite sets that up well. I think if Charlie Brown had answered that zero times zero was “nothing” it would have been right (or right enough) and Lucy’s exasperation would have flowed more naturally. As it is? She must know that zero is “nothing”; but then why would she figure “nothing times nothing” has to be something? Maybe not; it would have left Charlie Brown less reason to feel exasperated or for the reader to feel on Charlie Brown’s side. Young Lucy’s leap to “three” needs to be at least a bit illogical to make any sense. Now to the last strip and the one I wanted to warn about. 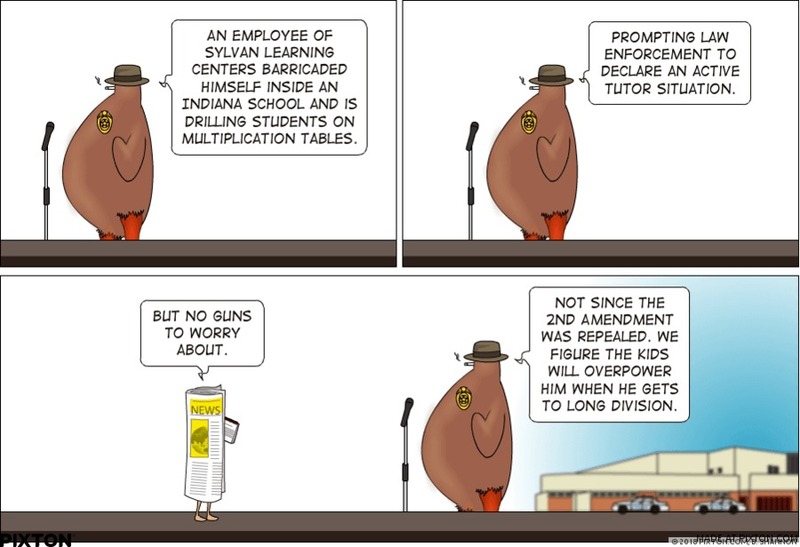 It alludes to gun violence and school shootings. If you don’t want to deal with that, you’re right. There’s other comic strips to read out there. And this for a comic that ran on the centennial of Armistice Day, which has to just be an oversight in scheduling the (non-plot-dependent) comic. Bob Shannon’s Tough Town for the 11th of November, 2018. Essays inspired by Tough Town will be at this link. Bob Shannon’s Tough Town for the 11th is built on the idea that “active tutor situation” is a funny thing to say. To that end mathematics gets brought in, as the sort of subject someone would get tutored for. And that allows for the sort of long string of questions that students could be drilled on. In this context it’s a cameo by mathematics.